Colorado is tough at work and at play. That’s the idea behind this microsite that I helped build at Visual Jazz. The whole thing was built in flash and oozed manliness from start to finish. It was my job to do all the flash programming to make this site come to life. Read on to hear me ramble on a bit more about some of the details. The main base for the site was split into two different sides. One side was the rough and tough ‘work’ side, full of rough, dark, industrial areas. The other side was the brighter ‘play’ side with a much more fun feel. Different sections of the site were related to either work or play. When a section was navigated to the entire background would pan left or right using a pretty cool parallax effect, with all the elements moving at slightly different speeds. To help give a bit of atmosphere, I did some quick little animation effects. These included some random floating clouds the work their way across the screen, as well as a random flock of birds that can occasionally be seen flying in the background. Page elements animated into place using quick, almost ‘bouncy’ motions, tweaked slightly to make the elements feel as though they had some weight to them. The panel that is used to display second level information is a very good example of this, as is falls into place like a heavy bit of steel. I set up the base code for the buttons in such a way that the designers could easily create custom animation effects. 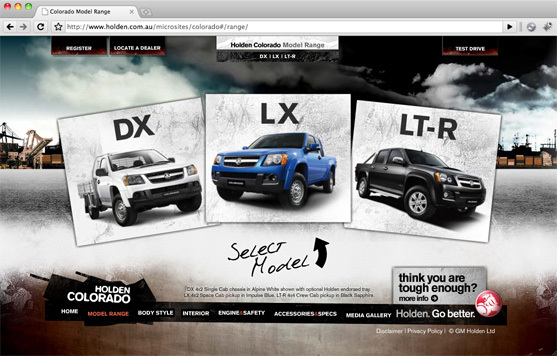 Examples of these can be seen throughout the site, as every major button tends to have a unique animation applied. 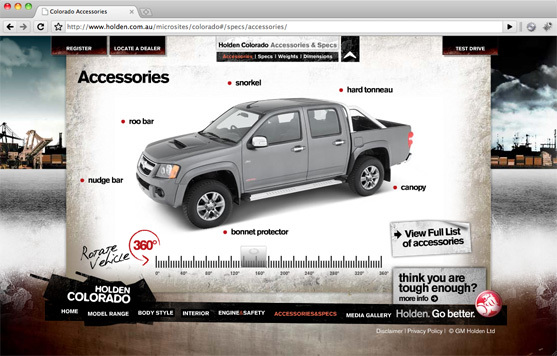 One particular page of note was the accessories page which used a series of photographs to generate a 360 degree view of the vehicle. 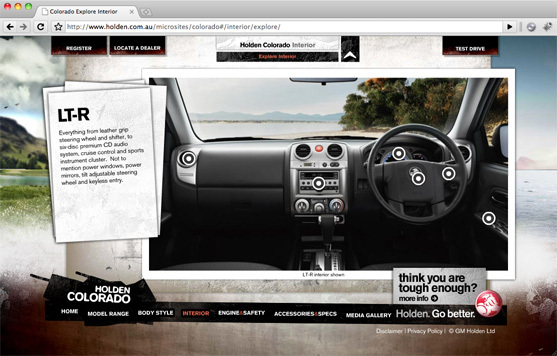 As the user drags the vehicle around, different features come into view, allowing more information to be displayed. I wish I could say that this was done using some fancy coding, but it is actually a carefully laid out timeline animation controlled via some code. Full credit has to go to the designer for this site. 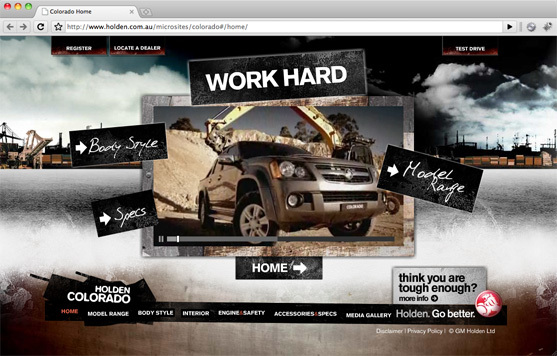 The rough ‘manly’ feel of the site really worked well, and the elements he gave me to work with made my job a pleasure. 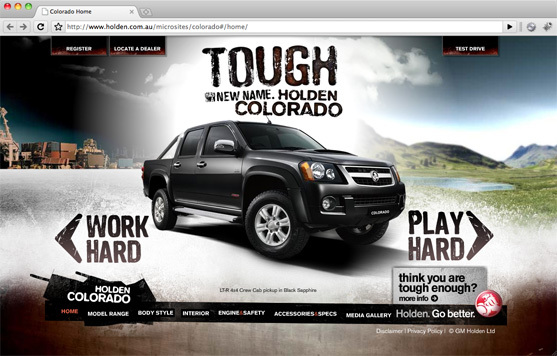 Although it was created a while ago, it is still a pretty cool site and can be checked out at http://www.holdencampaign.com.au/colorado/. You can also read about the project over at the Visual Jazz site.